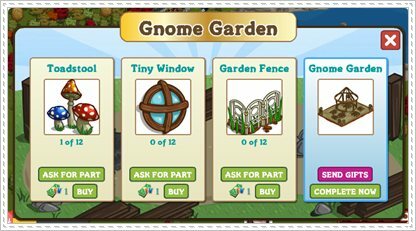 Now you can placed your Gnome collections in one place and keep track of them as FarmVille introduced the new building storage the Gnome Garden. The new building storage if completed will initially hold 10 Gnomes regardless of size and can be upgraded up to 6 times maxed which can hold 500 Gnomes! Each upgrade will also improve it’s visual appearance. 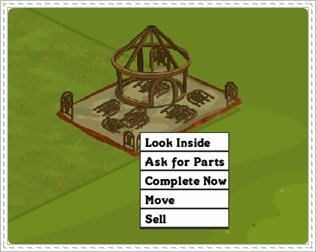 immediately in your farm. If you missed the message you may find it in your Gift Box just use search to easily find it. Or you can buy one at the Market. 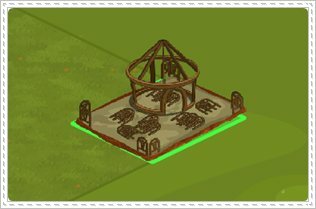 When placing the Gnome Garden you will notice a green outline around the unfinished Gnome Garden if the space is free. 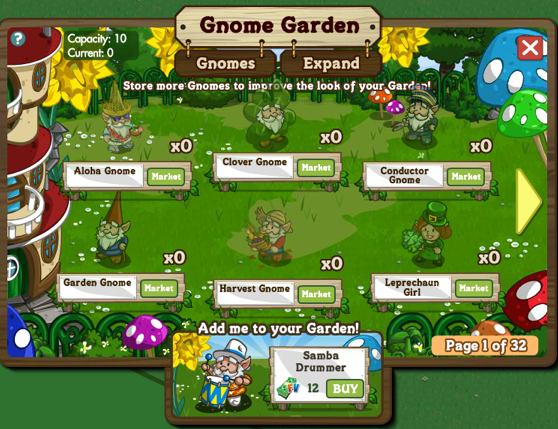 Complete Now – Pay Farm Cash to complete one stage of your Gnome Garden. Tiny Windows, Toadstool, and Garden Fence. Pink Pots, Twigs and Daffodils. Once completed, you can now place and see your Gnome collection. How to Place the Gnome? Just pick up the Gnome and hover it to the Gnome Garden, if the blue outline on the Gnome garden turned to orange then click on it.